The rumored dual Galaxy S10+ front camera has been embodied in this screen protector that has surfaced out of China today. The high-end model of Samsung’s next flagship is expected to come with two cameras up front. 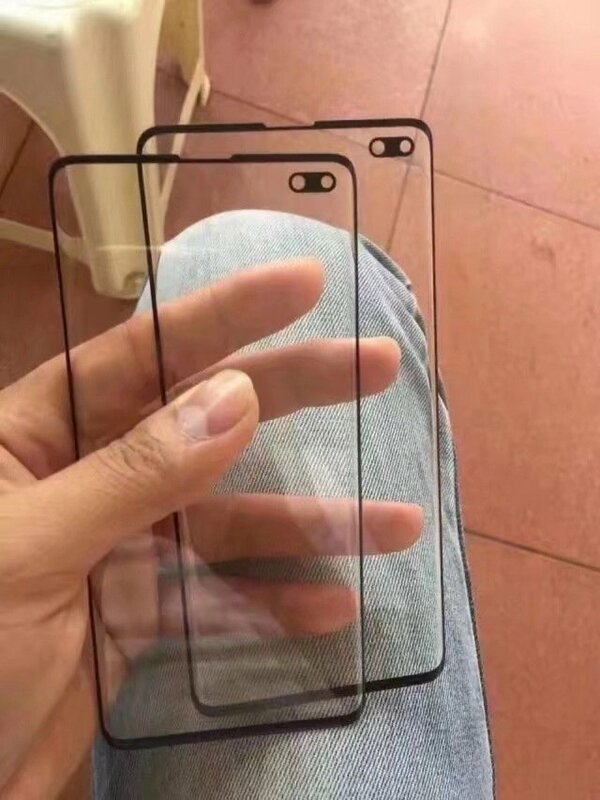 It won’t have a notch, though. Samsung is reportedly going with its new Infinity-O display for the device. This means that there will be a hole in the active display area for the front camera. The display hole design will be different for the Galaxy S10+ because the other models will only have a single front camera. To be clear, there’s conflicting information about the Galaxy S10+ display. The possibility of this device featuring the Infinity-O display has been highlighted only recently. The purported Galaxy S10+ dimensions and unofficial renders that surfaced recently also pointed in this direction. This screen protector makes a similar claim. The Galaxy S10+’s 6.4-inch display won’t have a notch but two holes in the panel’s top right corner. This will allow Samsung to stretch the display as much as it can without having to use a notch. It’s not completely averse to notches anymore, though. Samsung did reveal its notched displays at its developers’ conference last month. Even if all models of the Galaxy S10 are to get the Infinity-O display, it won’t be the first device with a hole-in-display. That crown will go to the Galaxy A8s. Samsung confirmed yesterday that it will be unveiling the Galaxy A8s in Beijing on December 10. It will most likely be released before the Galaxy S10. Samsung’s new flagship isn’t due to be unveiled before February next year. It will arrive at the Mobile World Congress 2019 in Barcelona. Shipments may begin the following month. Do take these screen protectors with a grain of salt. It’s not particularly difficult for someone to whip up a couple of them to add to the rumor mill’s frenzy. It’s horrible. I hope it’s not on Note10. If so I’ll keep my Note9. The cant give 100% screen you must consider where you put your finger on phone without touchinng the screen by mistake!! The vast majority of buyers won’t care about the pill shaped cutout. Just like most people dont mind the notch. Call it whatever you want but it WILL be the same as having a notch. Not like you can move the cameras about the top. No, this is worse way worse than a notch. I honestly can’t believe this is actually the design Samsung has chosen, it would be utterly embarrassing after all the notch mocking. Whatever the new infinity display design i hate it personally. It’ll be better if there’s a bezel on the s10 else many samsung fans will have to wait a year IMO..